NEW GLITTERFUL FELT STORIES GIVEAWAY!! 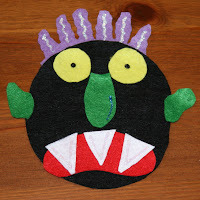 WIN A FREE FELT STORY FINGER PUPPET SET!! Congratulations to our winner Danielle!! Here at Glitterful Felt Stories we are proud to announce that we will now be carrying fun finger puppet sets! All our sets will go along with a story theme!! During the week of December 1st- December 5th you can enter! We will be giving away our first creation!! Three Little Pigs Felt Story Finger puppets!! 2. Tell us what you like about us!! 3. Leave your name and email address in case you are the winner!! 1. Grab our button...please let us know!! 2. Blog about our giveaway!! Happy Thanksgiving from Glitterful Felt Stories! We are so thankful to all our wonderful customer's and readers! After being on hospital bed rest for 16 weeks (yes they can keep you in a hospital that long! ).....we were blessed with the birth of our third child! Our son Tyler was premature and suffered from RSV shortly after birth. He had such a rough start into our world! After he recovered from RSV his body stopped producing white blood cells (the cells that fight off colds and infections) He had to begin doing white blood cell replacement therapy called GCSF. Due to large cost of this drug my husband and I started Glitterful Felt Stories to help defer the cost of his medications. He are so thankful today for his health!! He is improving everyday and his doctor's recently decreased his medication!! We are so thankful today for this wonderful blessing!! 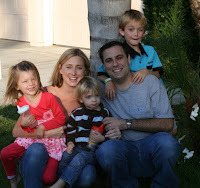 We are also thankful to Andrew and Ella's birthmothers. Who choose life for this two amazing souls and choose us to be their parents and raise them in this wonderful world. We love them so much and we are Thankful for the wonderful blessing they bestowed upon us! We hope this day finds you happy and healthy with the people who you love so dearly! Glitterful Felt Stories Featured in Top Gift List For Teachers!! We have had the honor of being featured in an article of "Top Gifts For Teachers!" You can read the article in the link below! 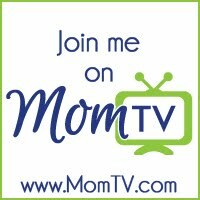 Thank you to Mom Most Traveled for featuring us! 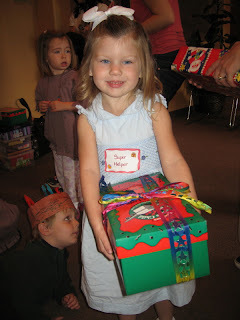 PAY-IT-FORWARD FREE FELT STORY HOLIDAY PROGRAM! FREE FELT BOARD STORIES!! Did we say FREE?.....Yes....Free Felt Board Stories!! We would like to introduce to you a wonderful program that we at Glitterful Felt Stories wanted to offer during our holiday season. We have found that there are so many hurting people in our world today and we wanted to offer a program that will help reach out and uplift these people! So we are starting our pay-it-forward free felt board story program! We have been converting most of our profits this month into Grocery certificates for local families we know that are out of work. We then decided to start this program to be able to reach out and help more people!! We ask that you comment below in this blog what wonderful deed you would do for someone in your community! It could be bringing a meal to a family that you know is out of work, dropping off some holiday toys for a family you know is in need, bringing cookies to an elderly person, or even donating your free story to a school in need! Your deed is up to you....and we are so excited to see what you decided to do!! 1. Post a comment of what you would do nice for someone if you got a free story! Our elves will pick people in our comment box to give your favorite free items away!! We will post all the winners at the end of the promotion! "Children are born when they are ready, creep when they are ready, walk when they are ready, talk when they are ready, BUT start school when they are told to." "What people need to understand is that just because a child is chronologically five does not necessarily mean his body is developmentally ready for school!" This is a wonderful project for children who write their letters backwards. This is also wonderful for children with ADHD and Autism. Enjoy! I've made you a miniature sand box. The purpose of this sand tray is to give you a place to practice your reading and spelling words. Just write them in the sand. For fun, you can have your children write them with their eyes close. A great variation to this project is to get a piece of fine sand paper. Write the letter or word they are working on. Have the child trace the letter/word with their finger. For all you OC Mom's that follow our blog we want to share with your some fun activities to do with your children in our own backyard! This Friday and Saturday Fashion Island will be having their tree lighting ceremony! One of Southern California’s best-loved traditions returns to celebrate the holidays, as Fashion Island’s majestic 115 ft. Christmas tree is illuminated with over 17,000 lights and ornaments. The event will include a song and dance performance by students of the California Conservatory of the Arts, along with the arrival of Santa. The show begins at 6 p.m. and will be held in Bloomingdale’s Courtyard of Fashion Island in Newport Beach. Immediately following the Tree Lighting Ceremony on Nov. 21, young visitors can meet with Santa to share holiday wishes and take photos. Santa will be at his custom-designed house on Atrium Lawn through December 24. RUDOLPH, RUDOLPH WHAT DO YOU SEE? FELT BOARD STORY SONG! Rudolph, Rudolph What do you see Felt Story Song Set! This is a wonderful holiday set that can he used to help teach your children their colors! Labels: Christmas Felt Stories, Felt Board Story, Flannel Board Story, Glitterful Felt Stories, homeschooling, Preschool Songs, Rudolph What do you see? Jesus Loves Me This I Know...... With Sign language! There have been many scientific studies show that children who learn sign language can have a higher IQ, are better adjusted and can read at an earlier age! Some of the wonderful benefits of signing with your children can help enhanced bonding and communication, development of fine motor skills, and assistance with reading and comprehension well into the elementary school years. Jesus Loves Me This I know is a fun way to introduce sign language with your children! This is a wonderful activity to do with your children! Have your children draw or paint a picture to help cheer up a wonderful person who has defended our freedom in our country! The American Red Cross is sponsoring a national "Holiday Mail for Heroes" campaign to receive and distribute holiday cards to servicemembers and veterans both in the United States and abroad. Holiday Mail for Heroes, which began Tuesday, Veterans Day, is a follow-up to the 2007 effort that resulted in the collection and distribution of more than 600,000 cards to hospitalized servicemembers. This year's program will expand its reach to not only wounded servicemembers but also veterans and their families. The goal is to collect and distribute 1 million pieces of holiday mail. "As we enter this holiday season-a time to celebrate with family and friends-it's important to remember the thousands of men and women who serve our nation in harm's way and those who are recovering in military and veterans hospitals," said Army Col. Norvell V. Coots, commander, Walter Reed Health Care System. The Holiday Mail for Heroes program is a wonderful outreach effort and a great way to acknowledge the sacrifices of our men and women in uniform. All cards must be postmarked no later than Dec. 10. Cards should not be mailed or delivered to Walter Reed Army Medical Center. Walter Reed is not accepting mail addressed to "A Recovering American Soldier." This is a super fun activity to do with the kids to give them an opportunity to help with your holiday decorating! Make sure and have your children help you mix the mixture together. (exp. Let them take turns stirring) Then let your children decorate a beautiful snow scene on your windows! The best part: It cleans much easier to clean than the spray snow you buy in the store! 1. mix the laundry detergent and hot water into a mixing bowl. 4. Use Paint brushes or sponges to decorate your windows! 5. Let it dry for about 20 minutes! Since many of our products are used to help children with ADHD enjoy reading, we found this to be important information to share with our readers! WEDNESDAY, Nov. 12 (HealthDay News) reported-- The U.S. Food and Drug Administration has approved a 30-minute onset of action for Focalin XR to treat attention-deficit hyperactivity disorder (ADHD). They reported that the early onset could especially benefit children ages 6 to 12 during the morning as they get ready for school, the company said in a news release. The drug helps curtail symptoms for up to 12 hours. ADHD affects about 3 percent to 6 percent of children in the United States, with symptoms including inattention, hyperactivity, and impulsive behavior, Novartis said. 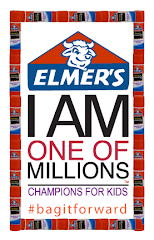 The new labeling is based on clinical data, including a study of 86 children ages 6 to 12. The drug provided significant symptom improvement 30 minutes after administration, compared to a non-medicinal placebo, the company said. Every year we participate in Operation Christmas Child, a ministry that delivers Christmas gifts in shoe boxes to needy children around the world! National Collection Week is November 17-24. Log onto www.samaritanspurse.org for directions on how to pack a shoe box, items of need, and your local drop-off locations! This has always been my Children's favorite activity to show love and goodwill towards other children in the world! Help your child learn to give thanks to the Lord for His many blessings and realize how we have been blessed to be a blessing to others! Improve your children's listening skills and imagination through Literacy! Read a story aloud to your child and stop before the end of the book. Ask your children how they think the story will turn out. Then finish the story and discuss the ending with you children. 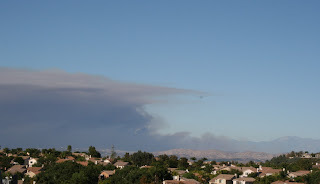 Here is a picture of the newest California Fire that started this weekend. This is the view from the front of our house! Production is still going and no orders have been interrupted. Our thoughts and prayers go out to the families who have lost their homes or been misplaced during this horrible tragedy so close to home! We were honored to hear that our "5 little Apples" Felt Board Story was just featured in a list of favorite items treasury list! Thank you so much for adding one of our favorite items! WINNER OF OUR GLITTERFUL FELT STORIES FLANNEL BOARD GIVEAWAY!! Today we did the raffle for the giveaway of the 16 x 20 Felt Board and two Felt Stories! Andrew helped out with the drawing and had so much fun doing it! Thank you so much to everyone for all your wonderful comments and suggestions! Come back soon for more Felt Story giveaways!! Putting all the names in the bowl! And the winner is...... Stacey......Congratulations!! Art Can Encourage Learning and Literacy! To Exercise my imagination and creativity! Art Activities are more than just fun! It is an important tool for learning! Fingerpainting is part of our daily routine in our house. I wanted to share a great recipe that I use a lot to hand make our own fingerpaint! The kids will have fun helping me mix the ingredients and then getting to use the paint to create their masterpieces! In a pot mix all the ingredients together! (Have you kids help!) Adults only cook on the stove top for about 15 minutes until it is thick. Keep stirring it during the 15 minutes! Let it cool! 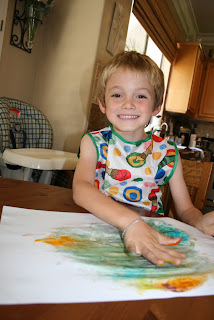 Divide the paint into different sealed containers....stir in the food coloring....and you have made fingerpaint!! The Winner is lynnae! Congratulations!! Although I like most of my product reviews to be Early Childhood and Literacy related.....this product is so amazing that I want all Mom's to know about it! Having three children to chase after, laundry to do, food to cook and running my own business it can sometimes to be hard to find time to organize my personal finance budgeting. The Money Smart Mom Savvy Spending system will make your life as a Mom so much easier! Money Smart Mom has great easy to use free online budgeting tools that will calculate all your weekly and monthly spending for you. I absolutely love the features of her designer wallet. I have never had a such a functional yet stylish wallet and with the stay at home portfolio and booklet it makes system so easy to organize. 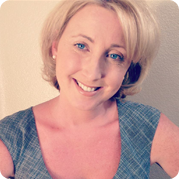 Orielle Hopkins has created an amazing system to help Moms Learn the fun way to make your money last and grow, with the Money Smart Mom system. Created by a Mom for Moms. She created a cash budgeting system that is similar to the envelope budgeting system but much easier to manage and far more organized. Not to mention they have a highly fashionable wallet made exclusively for Money Smart Mom. 2. Tell us what you like about the Money Smart Mom Savvy Spending System and post your comments on our blog! 3. Tell your friends to enter our contest! 4. Leave your email address so we can notify you if you win!! Become a Money Smart Mom Member and enjoy using here FREE online tools! Want to spend more "quality time" with the family? Calling all kids, moms and dads, grandparents and great-grandparents! Lead by example and bring your entire family out and volunteer. Family Volunteer Day, on November 22nd, is a meaningful and inspiring day of national family volunteerism, where everyone will be able to contribute to a variety of tasks. It is a hands-on way to teach children the values of kindness, compassion, tolerance, community responsibility and good citizenship. HandsOn Network, generated by Points of Light Institute and The Walt Disney Company proudly presents Family Volunteer Day. This annual day of service, held on the Saturday before Thanksgiving, is designed to demonstrate the power of families who choose to volunteer together to support the communities in which they live and serve. Volunteering as a family provides quality time for busy families strengthens communication and bonds and positively impacts local communities across the nation. Visit http://www.familyvolunteerday.com/ for details on how to fully capture the value of this opportunity! You can log in and enter your zip code for an event close to home! WOW! I got the most fun special order request this weekend! 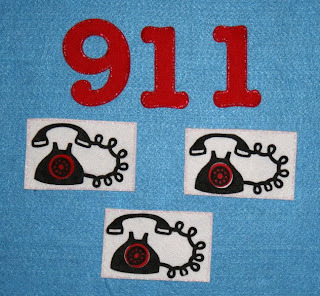 An EMT in Florida contacted me to create an ambulance theme felt story for a community outreach event they are having. I quickly started to do my research on ambulance theme's and quickly was shocked to find that there is nothing out there to teach our children about these wonderful community hero's! I searched online, went to the library, went to the bookstore and researched my 36 teacher resource books. Nothing! During dinner last night I was talking to my family about how surprised I was that there is not any songs or stories for young children to talk to them about ambulances. My son Andrew who has peanut allergies and has had to make many trips in the ambulance suggested that we write something together! We all had so much fun writing a special short story and creating a song! It was a wonderful family moment and our children and us will remember forever! Andrew's Ambulance Ride Felt Board Story! It's Monday! Our New Story is The Three Little Pigs Felt Story! It is a really cute detailed flannel board story with many fine cuts and decorations! On Monday only you can get our new story at 50% off! Have any uncarved pumpkins left? Make it a sensory experience! My children are living proof that sensory fun is the BEST kind of fun! We took our left over pumpkin and poured shaving creme over it. I let the kids feel, touch, explore....and my son Andrew really explored it! They were running cars in the shaving creme, making snow angels on the table and having a blast! Me best suggestion would be......make it an outside project! We are currently offering a coupon of 10% off your purchase on our main website only. http://www.glitterfulfeltstories.com/! During the checkout process please use the coupon code mama10 to get your 10% savings!! WE WILL ANNOUNCE OUR WINNER ON WEDNESDAY NOVEMBER 12TH!! Glitterful Felt Stories is having our First Giveaway! Two Felt Board Stories of your choice! The contest will run from November 1st- November 8th! 2. Tell us what you like about us! 3. Comment on what two stories you want to win! 4. Tell your friends to enter our contest! 5. Join our blog! Or Leave your email address so we can notify you if you win! !